Whether you like them classic or sporty, there’s something for everyone. If there’s one thing that a Grand Seiko is all about, it’s precision. Precision in engineering, precision in finishing and precision in chronometry. 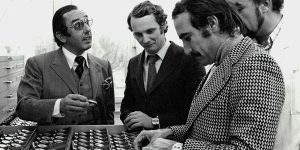 After all, the Grand Seiko was born from the desire to build the world’s best watch. Launched in 1960, it has never stopped pushing the boundaries mechanical timekeeping and has maintained chronometer level accuracy since day one. But just 10 years after its inauguration, the Grand Seiko no longer carried the word ‘chronometer’ on its dial. The reason for that however wasn’t because the watch lost its zest for precision timekeeping. Rather, the reverse is true. 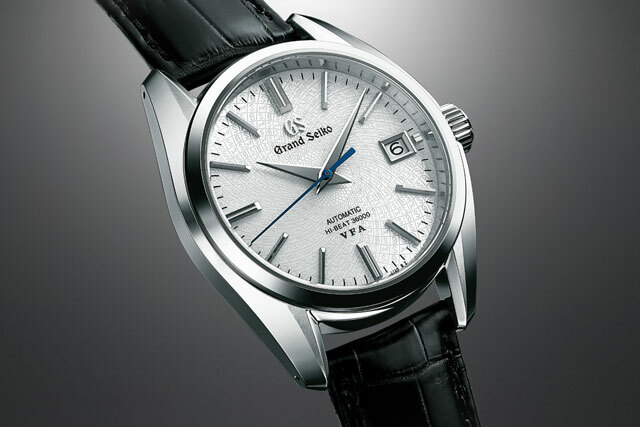 In the 1970s, Grand Seiko had introduced its own, higher, standard known as the New GS Standard. 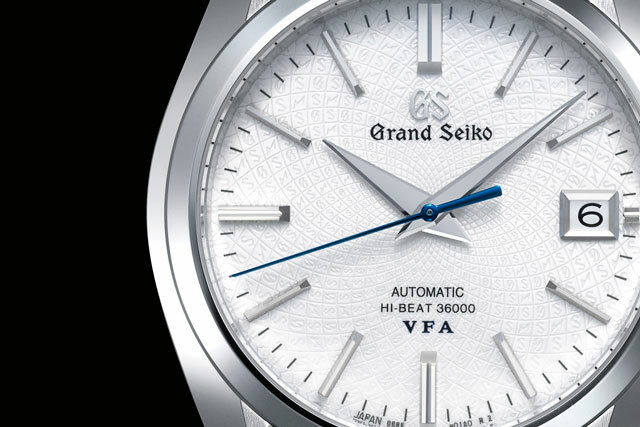 The New GS Standard subsequently received an update in 1998 that made the Grand Seiko precision criteria even more stringent than any other on the market. Championing this new level of chronometric precision was the in-house manufacture Calibre 9S, which was released that same year. This top-of-the-line calibre adjusted to the Grand Seiko Special Standard represents the best of Grand Seiko haute horlogerie, as it is assessed against a rigorous series of tests over the course of 17 days. Checked in six different positions and at three different temperatures, its daily rate tolerances are an impressive +4/-2 seconds a day. This is at least equivalent to the COSC industrial standard. But some versions of the Calibre 9S go further than that. Designated with the “Very Fine Adjusted” label, they are accurate to just +3/-1 seconds a day. Abbreviated VFA on the dial, this term was first used in 1969, and it raised the bar yet again for this extraordinary timepiece. In 2018, celebrating the 20th anniversary of the Calibre 9S, Grand Seiko brought back the VFA tradition in a gorgeous classic platinum model, along with a yellow gold version, plus a third piece in stainless steel. Powered by Calibre 9S85 which is a hi-beat 36000, the platinum VFA model reference SBGH265 is accurate to +3/-1 seconds per day as promised and had endured a prolonged testing phase of 34 days—twice as long as regular Calibre 9S movements. This piece is delivered in the classical Grand Seiko aesthetic which was created by Nobuhiro Kosugi, designer of the first 9S Grand Seiko in 1998. Its dial is also pretty unique. 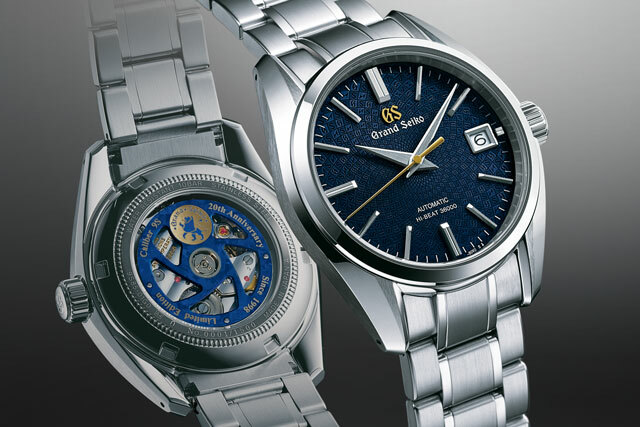 A delicate mosaic style engraving radiates from the centre in a contemporary geometric pattern featuring the GS insignia as well as the special logo designating watches made by the Daini Seikosha division, which eventually became known as Seiko Instruments Inc. Daini Seikosha was where the company developed the first Grand Seiko Hi-Beat watch in 1968. All three watches run on the Calibre 9S85 but only the platinum model reference SBGH265 carries the VFA hallmark. 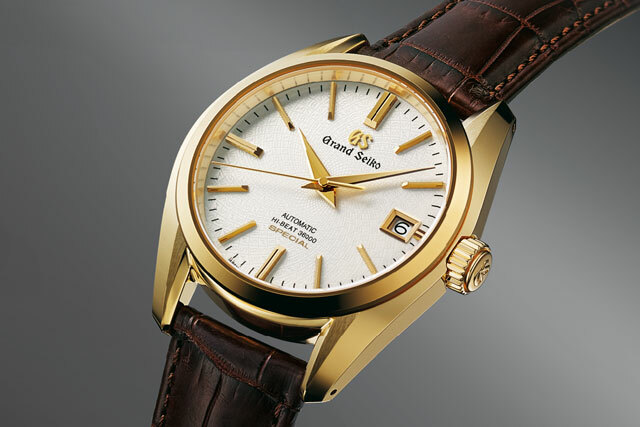 The other two references are slightly less accurate, where the yellow gold piece reference SBGH266 had been adjusted to the Grand Seiko Special Standard of +4/-2 seconds per day, and the stainless steel piece reference SBGH267 comes in third place at +5/-3 seconds per day. 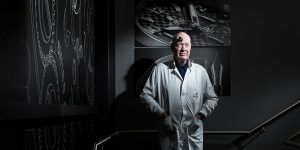 The watches are all 39.5mm in diameter, fitted with exhibition case backs, and limited edition—20 pieces in platinum (€53,500), 150 in yellow gold (€27,000), and 1,500 in steel (€6,300). 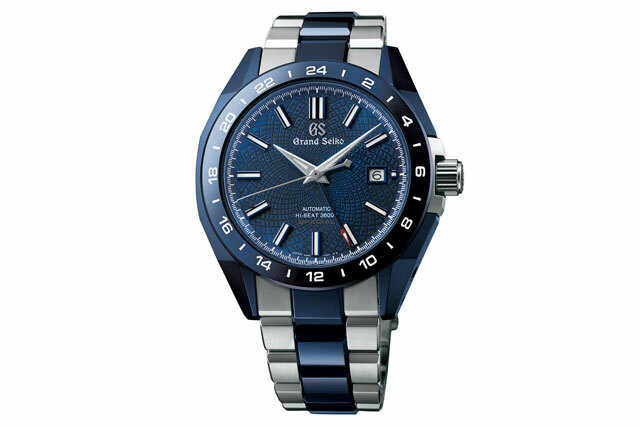 But if you’re looking for something more failsafe, and by that we mean shock- and scratchproof, consider the Grand Seiko Blue Ceramic Limited Edition with its high-intensity titanium and ceramic case. Adjusted to the Grand Seiko Special Standard, this timepiece is accurate to +4/-2 seconds per day and runs on the Calibre 9S86 movement which like the aforementioned models, has a hi-beat 36000 frequency. On top of that, it’s got the GMT function thrown in and a higher-than-average magnetic resistance of up to 4,800A/m. 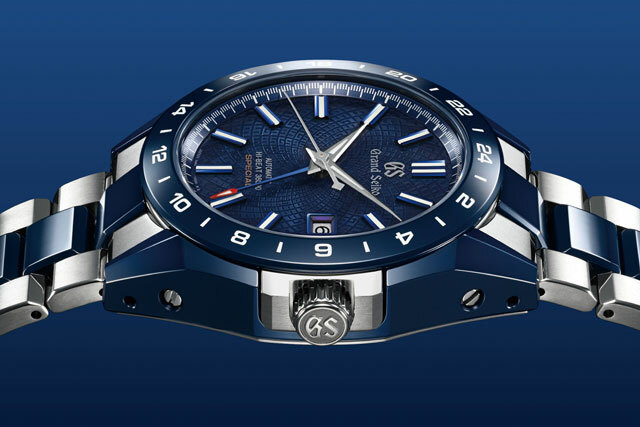 The watch’s outer case and the centre links of the bracelet are made of the new Grand Seiko blue zirconia ceramic, a material that is seven times harder than stainless steel, rendering the watch virtually impervious to scratches. Its oscillating weight is made in a combination of titanium and tungsten which helps the movement resist distortion when it’s been subject to shock. Aesthetically this watch differs by leaps and bounds from the classical models. 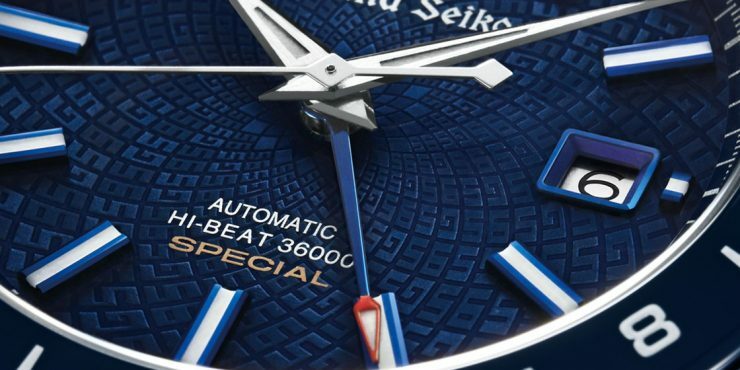 Even as its dial had also been given the mosaic style engraving, it features a unique pattern never before seen in any other Grand Seiko model. Known as reference SBGJ229, this modern sporty Grand Seiko is also a limited edition piece. Priced at €15,000 (S$20,544), only 350 of these will be made, so it’s neither cheap nor plentiful, which means this is definitely a keeper—if you can get your hands on one. 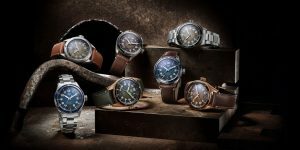 The 2018 Grand Seiko collection is available at Seiko boutiques in Vivocity and JEM. Visit the Grand Seiko Facebook page for more information.